One to two weeks prior to you starting the HairPrime® Treatment Program, count the number of hairs that you lose daily after washing and brushing/combing/styling your hair. This may require you to place a piece of wire mesh over the drain in your bathtub, shower or sink. The average hair loss may be as many as 100 hairs a day, but it is important to know YOUR daily average hair loss. After the first month's COMPLIANT use of the HairPrime® products, we do not expect the average person to notice any difference as the hairs that have been affected by DHT will most likely fall out due to the shortened growth cycle. [DHT, dihydrotestosterone, has been linked to hair loss and thinning due to its effect on shortening the growth phase cycle of the hair from 3-5 years to 3-5 weeks. Since hair only grows on the average ¼ to ½ inch a month, it is obvious why a shortened growth cycle yields such short and fine hair only to fall out prematurely.] If after the first month your hair loss is worse than before, then we suggest you stop using HairPrime® and contact us to review your situation. After the second month, the average person finding success using the HairPrime® products experiences a significant reduction of daily hair loss. 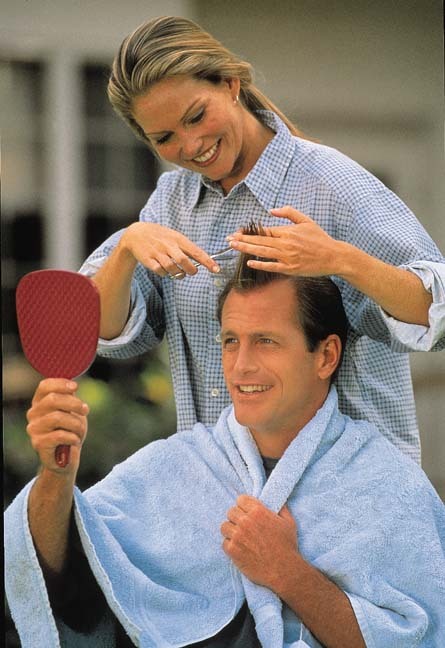 For example, a person losing 100 hairs a day before the treatment has daily hair loss of only 50-70 hairs a day. Please realize that since hair only grows ¼ to ½ inch a month, the individual hairs that only began their growth cycle again after falling out in the first month will be no longer or thicker than the baby fine hairs that grew prior to your using HairPrime® . After the third month, if the hairs that started their new growth cycle in the second month grow beyond ½ inch in length, we may consider this a sign of the beginning of conversion from vellus to non-vellus hair, thus the growth cycle extending beyond 3-5 weeks. If by now your daily hair loss count has not decreased from before using HairPrime® , then the program may not be working for you. Rather than waste your time and money, we suggest that you stop using the product and contact us. After the fourth month, the daily hair loss count should be consistently less than before the use of HairPrime® . Furthermore, the hairs that began their growth cycle in the second month should be 1 inch or slightly longer if the conversion has taken place. After the six month, along with the continued growth in length and thickness and reduced daily hair loss count, you should be experience an improvement in the hair anchor...i.e. the hair should be more difficult to physically pull out. You may test by picking a hair that is about 2 inches long and tugging on it firmly. After 12 to 18 months, each hair should have started a new growth cycle and at least 50%-90% of the hairs should have achieved a conversion from vellus to non-vellus, terminal extended growth. After achieving satisfactory results, you may adjust your application of the topical treatments down to twice a week, once, once a week, once every two weeks, etc. until you find your own maintenance regimen.